In search of farmer to crop 30-40 acres of virgin ground in eastern Powhatan, close to 288 and Route 60. Acreage was recently cleared of hardwoods, stumps removed and topsoil graded, beautiful seed bed ready for spring/early summer planting. Will entertain longer lease option or 1-2 year lease. No rental charge with understanding of farmer planting and fertilizing. 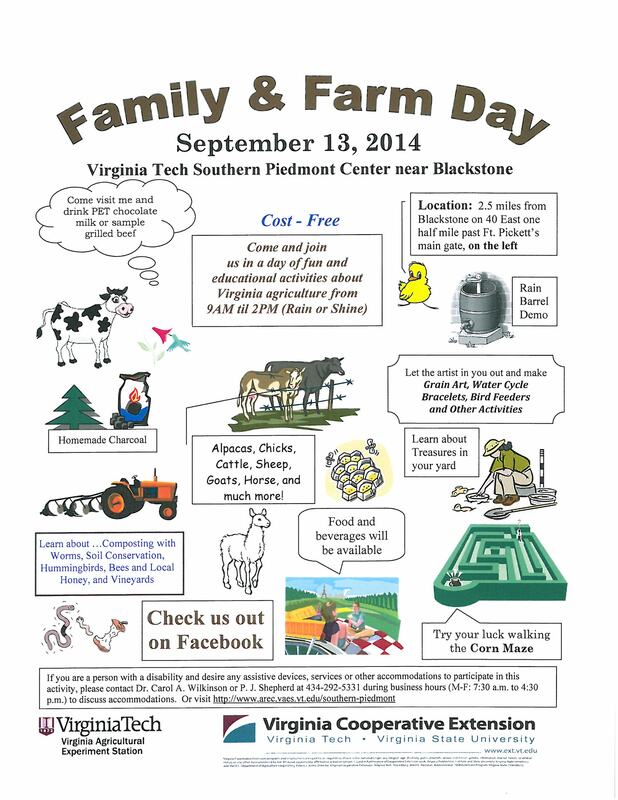 Please contact Harold and Christina Ellis for more information. hellis@ppinfrastructure.com or cellis@ppiservices.com. 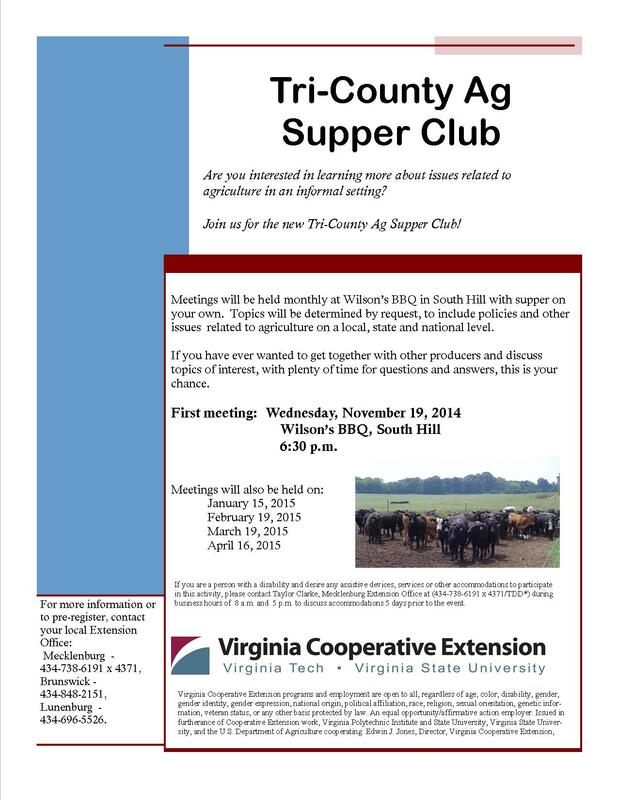 THIS WEDNESDAY: Come on out for the Tri-County Ag Supper Club on Wednesday night, November 19th, at 6:30pm at Wilson’s BBQ in South Hill. 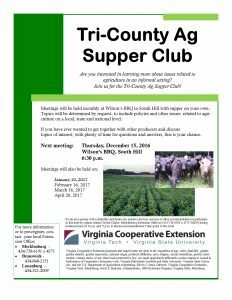 This group, comprised of the Lunenburg, Mecklenburg, and Brunswick Counties, will be meeting once a month through April to allow producers a chance to ask questions, learn more on a particular topic of interest, and enjoy fellowship with our friends and neighbors. Supper is on your own, and topics will be determined based on requests, so let us know what you would like to learn about. Try to let your agent know if you know you are coming just so we can make sure we have enough room for everyone. Thanks. The First Two Weeks of November! Don’t miss out on the great events happening the next two weeks! Get caught up on the latest of how to make your greenhouse more energy efficient as well as how take advantage of energy efficiency funding and programs. Learn about ginger and turmeric production in this two-hour workshop at Virginia State University! This field day will focus on energy efficiency in curing as well as the importance of cover crops for the winter months. For those interested in starting a greenhouse enterprise. Check it out! THIS Wednesday, July 2, at 6:30pm at the Ripberger Public Library in Kenbridge, Virginia Cooperative Extension will be holding a review session for the private pesticide applicators test. You must be certified as a Private Applicator if you use restricted use pesticides to produce an agricultural commodity on land you own, on land you lease, or in exchange for services with another producer. Following the review, the private applicators test will be offered on paper for who feel adequately prepared for the test. The private pesticide applicators test can be taken at any time by appointment at the extension office. 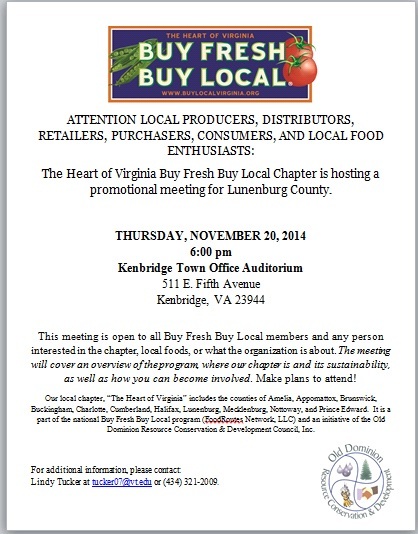 To let me know you are coming and to ask questions, please contact Lindy Tucker (434) 321-2009.